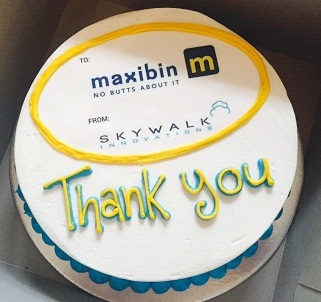 Maxibin has enlisted the services of Skywalk Innovations to use technology, and the trend towards using mobile apps in business, to enhance the client experience of Maxibin’s servicing and lease agreements. 1. It eliminates the need for the servicing agent to interrupt the client to sign off on the bin’s service. 2. It allows Maxibin to provide streamlined reporting to clients and manage their bins locations and servicing effectively. 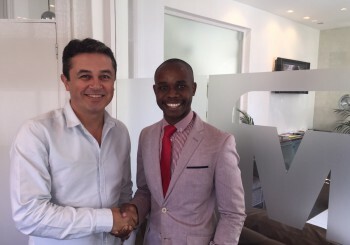 In a meeting between Rod Wannenburgh, director of Maxibin, and Siyabonga from Skywalk Innovations, the app’s functionality was demonstrated – a technology first of its kind with some exciting future advancements planned. Skywalk Innovations was formed by Siyabonga and his business partner in September 2014, and have grown quickly, now employing 10 application developers. Their current focus is on 3 industry targets: Transport, Real estate and construction. Siyabonga has a National Diploma in Software Development from the Cape Peninsula University of Technology and is currently pursuing a B.Tech in Advanced I.T. Management. Their company uses the platform, Journey, to develop mobile apps, specialising in online booking systems, for example, applications for gyms where members can book training sessions online. Skywalk Innovations is a growing small business under the care of Shanduka Black Umbrella who help manage startup businesses over a three year period. Where Siyabonga and his partner have strong technical backgrounds, they lack marketing skills and this is where Shanduka step in to provide training.